Mike and Frank get revved up about an awesome new client: North Carolina's NASCAR Hall of Fame. 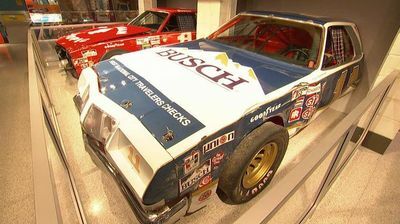 The curators have asked them to scour the country for relics that help tell the unique history of auto racing. But with their limited budget, they're under even more pressure to deliver. Their first stop is Tiger Tom's auto shop. The veteran racer's collection dates back over half a century and includes must-have items that changed the face of racing. Also in this episode: "Humpy" Wheeler is the former president of the Charlotte Motor Speedway, and although his attic is a gold mine, getting him to part with any of his treasures takes serious charm and a charitable strategy. Later, Billy Biscoe was in the pit crew of a NASCAR champion and has a collection of jaw-dropping artifacts that's as impressive as his stories. And, picking takes a back seat when Mike and Frank climb into a pair of vintage racecars for a drag race showdown.